Coll. No. 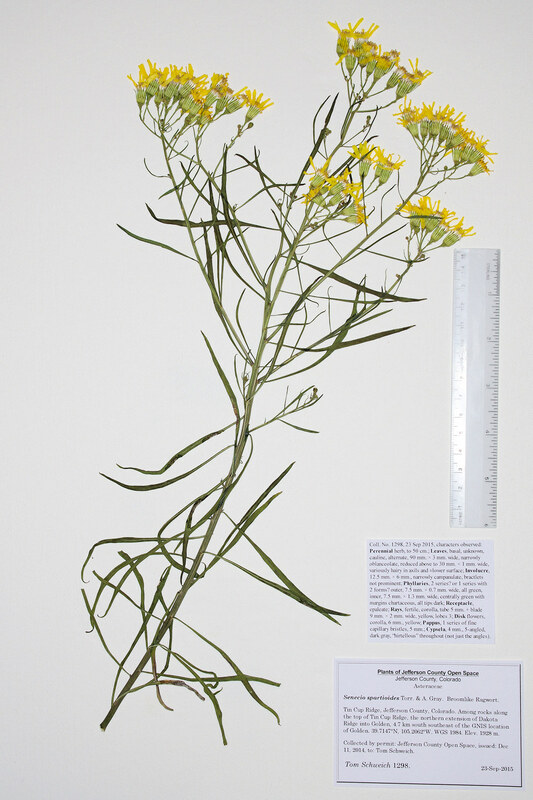 1298, 23 Sep 2015, characters observed: Perennial herb, to 50 cm. ; Leaves, basal, unknown, cauline, alternate, 90 mm. × 3 mm. wide, narrowly oblanceolate, reduced above to 30 mm. × 1 mm. wide, variously hairy in axils and ±lower surface; Involucre, 12.5 mm. × 6 mm., narrowly campanulate, bractlets not prominent; Phyllaries, 2 series? or 1 series with 2 forms? outer, 7.5 mm. × 0.7 mm. wide, all green, inner, 7.5 mm. × 1.3 mm. wide, centrally green with margins chartaceous, all tips dark; Receptacle, epaleate; Rays, fertile, corolla, tube 5 mm. + blade 9 mm. × 2 mm. wide, yellow, lobes 3; Disk flowers, corolla, 6 mm., yellow; Pappus, 1 series of fine capillary bristles, 5 mm. ; Cypsela, 4 mm., 5-angled, dark gray, “hirtellous” throughout (not just the angles). Tin Cup Ridge (social trail), Jefferson County, Colorado: Coll. No. 1298, 23 Sep 2015. Field Notes: Coll. No. 1298, 23 Sep 2015. Other photos about Species - Asteraceae or Senecio spartioides.